For this type of cooler, our clients typically load their material such Molybdenum Oxide, quicklime, iron ore, etc…. where after the roasting process,the product enters the coolers at typical temperatures of approximately 620 Celsius and after cooling discharging at about 50 Celsius within 40 minutes, making it easy to handle Violations of environmental standards are eliminated, and in plant working conditions are improved by state-of the-art air control equipment. 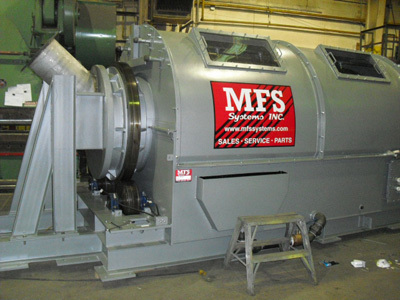 MFS Production Rotary cooler becomes a major profit center for our clients by being able to produce a better quality product. Our coolers are replacing rotary screws which tend to break down. Unlike our coolers which are very roughed and can handle as much as it is designed to.If the material fit coming into the entry end our machine can handle it without breaking down.